In a mixing bowl, smash diced avocado with salt and lime juice until fairly smooth. Place smashed avocado in serving bowl/plate. Whisk all marinade ingredients in a bowl. Dress minced hamachi with the marinade. Place on top of smashed avocado. Serve with potato chips or crackers dusted in Old Bay seasoning. This dish has smooth richness as well as tangy, bright flavors which are not lost on the palate when paired with our crisp, lively unoaked Chardonnay. 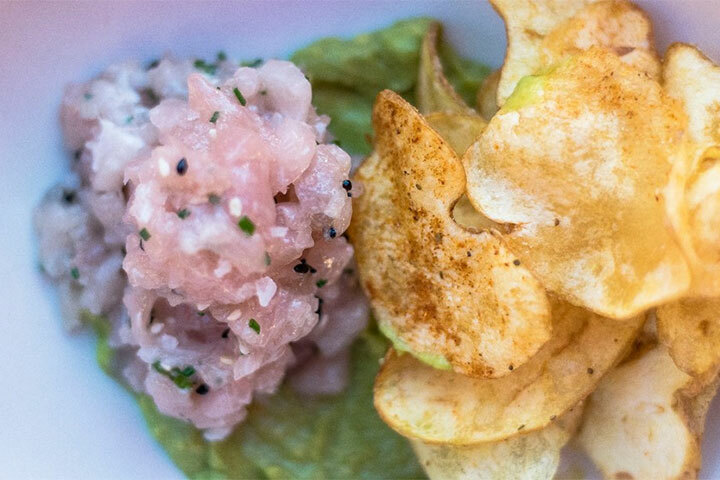 The luxurious Hamachi and its buttery rich avocado accoutrement are given a burst of zesty lemon and white soy for a clean, delicate umami profile which pulls the wine’s minerality guiding all flavors to “pop” on your palate.